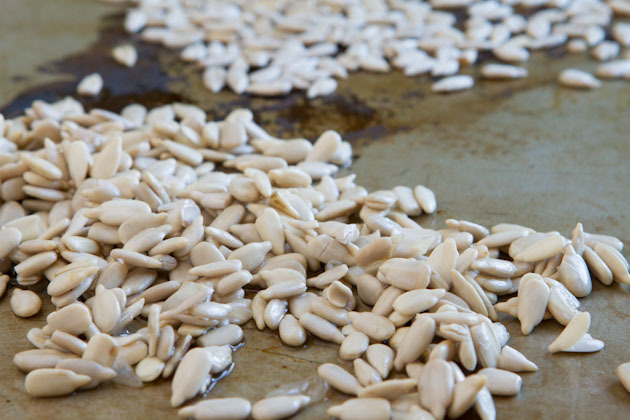 Today we’re learning how to make milk… sunflower seed style. 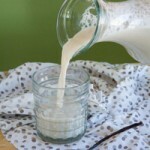 This recipe is awesome for anyone who who’s allergic to nuts, oats, rice, soy or any other ingredient that’s been transformed into a dairy-free milk. 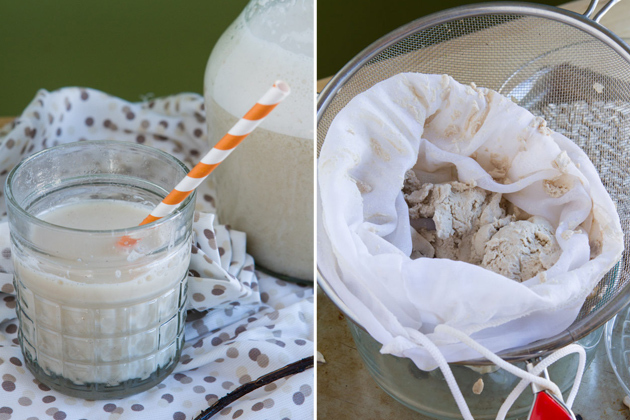 … and if you’re allergic to sunflower seeds, have you seen my flax milk recipe? … and if you’re allergic to flax… well, umm… let me know and I’ll see if I can create something for you. I’m always up for a challenge! Because they’re high in vitamin E and vitamin E keeps our immune system rockin’ and our skin glowing. We all like glowing skin. Also, they’re loaded with magnesium that helps keep our bones strong and our muscles chilled out and relaxed. Lastly, you’ll find a bunch of selenium in these little guys, the trace mineral that’s believed to help repair our DNA. Little power bombs, these guys are. 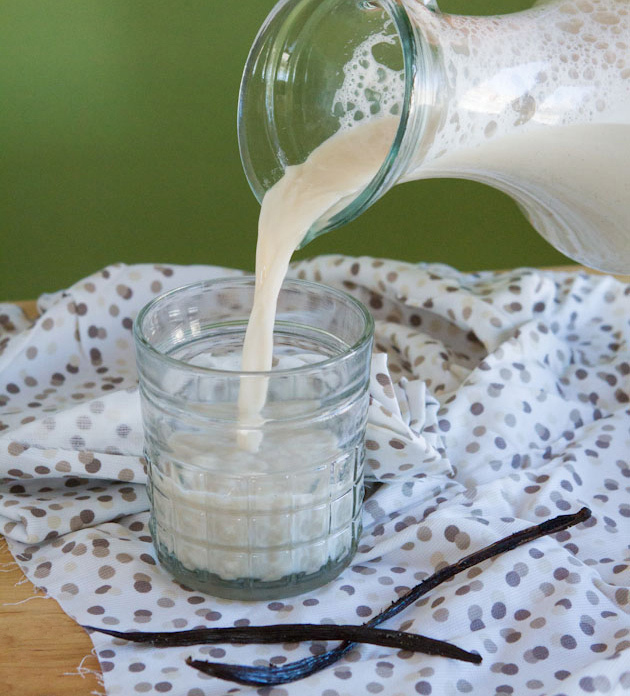 Creamy and delicious homemade vegan milk that's just as good as almond milk... without the nuts! Place sunflower seeds in a glass container and cover with water. Cover and allow to soak on the counter for 8 hours. Drain water, rinse well and add to your blender along with 4 cups of clean, filtered water. 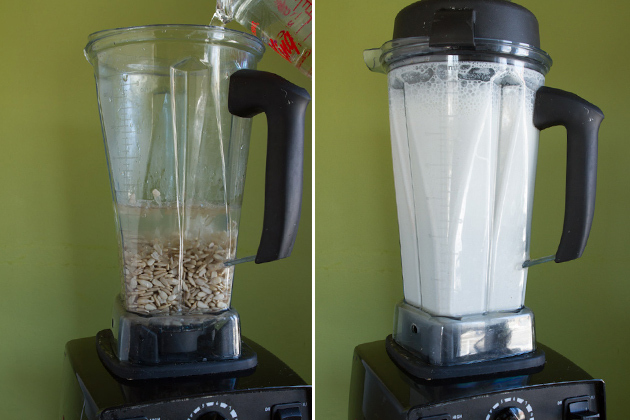 Blend water and seeds for 3 minutes. If you have a vitamix, I like starting off on the low setting, then pumping it up to full power for the last 1 minute. 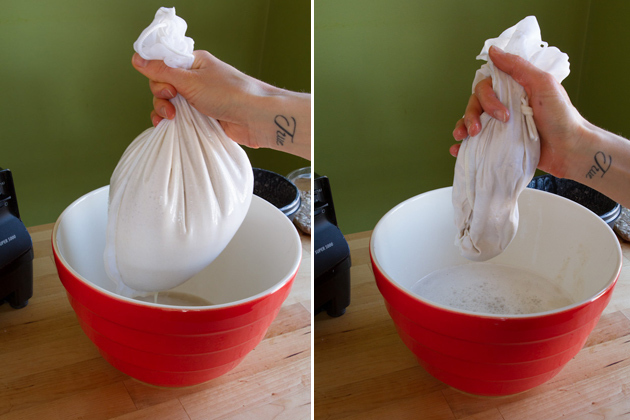 Once complete, pour seed mixture into a nut milk bag or a new (unused) nylon sock over a large bowl. Gently pulse the seed bag with your hands until all liquid has been strained out. Set pulp aside. 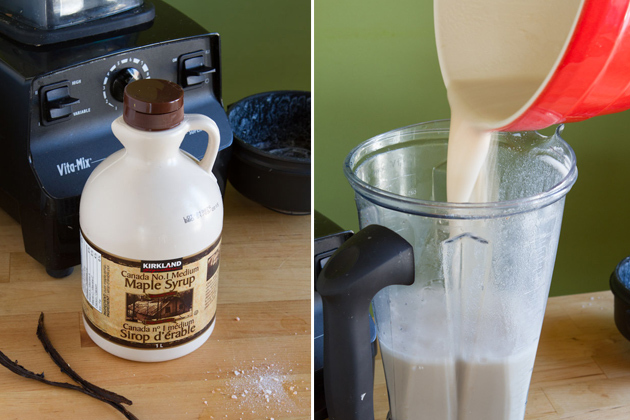 Rinse out your blender, add the milk back to it, add the maple syrup, vanilla and salt. Blend for 20-30 seconds. 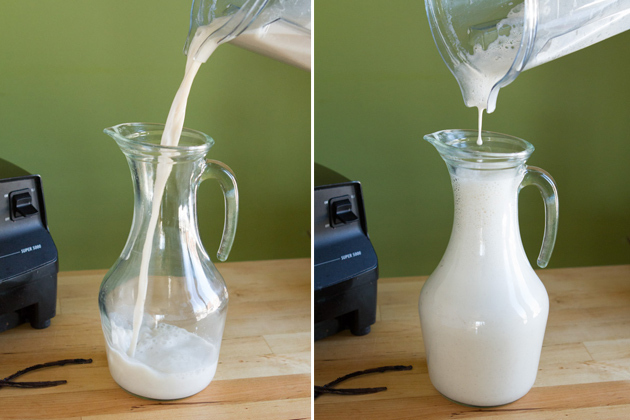 Pour into a milk jug or juice container and store in the fridge for up to 2-3 days. For cereals and baked goods: use the recipe above. For casseroles and other savory recipes, ditch the maple syrup and vanilla. For a sugar-free version, you could use a couple of drops of stevia or sweeten with 2-3 medjool dates added to the blender with the vanilla and salt, pureed for 1-2 minutes. Feel free to add cinnamon, all spice, cardamom or nutmeg for some added awesomeness! I’m sure this recipe could be made with any type of blender. Just make sure that you soak the seeds and let the blender grind them up into the finest, fine powder… ever. When its all blended, you need to separate the fiber from the milk. 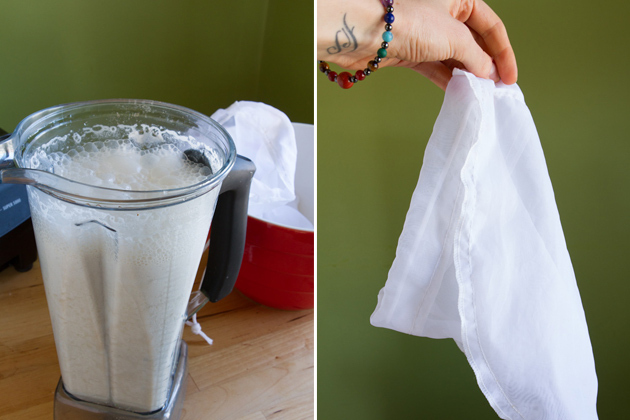 To do this, get yourself a nut milk bag (seriously, the best $7.99 you’ll ever spend). Once you’ve poured the milk in the bag, squeeze gently until all of the liquid has been removed. Make sure you don’t go all Rambo on the bag or the fiber from the seeds will get pushed through the mesh bag – or worse – out the top of the bag. Wash your blender quickly, add the milk back to your blender along with vanilla, maple and salt. Blend for a 20 second or so, to combine well. Pour into a pretty jar and sip right from the jar (no one will know), get yourself a glass and go to town, or chill for a couple of hours and pour over a bowl of cereal. Whatever you do, I know it wont go to waste! Speaking of waste, I’d love your thoughts on what I should do with this sunflower seed pulp. I don’t have the heart to throw it out! Totally unrelated to sunflower seeds – the Healthful Pursuit Facebook Page hit 10,000 likes on Sunday night and I recorded a little video of gratitude for you when I heard the news. Getting to chat with each of you on a daily basis, cook my brains out and share my health experience is the bestest ever… and I owe it all to you!